[11 October] Update: The Chinese authorities have threatened nuns at Larung Gar with a complete ban from religious studies if they do not volunter to leave. Video footage has emerged highlighting the ongoing expulsions and demolitions. One thousand dwellings have been targeted for demolition by the end of the year. Another Buddhist Institute in eastern Tibet, Yachen Gar is also experiencing mass expulsions. On 20 July 2016, the Chinese authorities began a programme of forced expulsions and demolition of dwellings at the Larung Gar Buddhist Institute in Serthar county, Kham (now part of China’s Sichuan province) aimed at reducing the resident population of monks and nuns by half to 5,000. The programme is due to be completed by September 2017. Three nuns have committed suicide since the demolition work began in protest against what one of the nuns referred to as “the endless Chinese harassment of innocent Buddhists”. Nuns at Larung Gar have been told by officials that unless they volunteer to leave the Institute they may not be permitted to resume their studies elsewhere. According to Radio Free Asia (RFA), on 23 September monastic officials offered nuns the option to volunteer to leave Larung Gar with compensation of being transferred to other monastic institutions in the region. However, they were also told that those who failed to volunteer would be at risk of forced eviction with no guarantee they would be allowed to continue their studies elsewhere. Threats have also been made of the withdrawal of financial assistance, both to the students themselves and to their families, if they fail to comply with official orders. Monks and nuns originally from the Tibet Autonomous Region (TAR) were known to be among the first to be targeted for expulsion from Larung Gar. Subsequently, students from all Tibetan areas outside of Sichuan province are facing orders to leave, which includes Tibetan prefectures in Qinghai, Gansu and Yunnan provinces. The number of expulsions to date is not known due to the authorities block on communications in the region. However, according to RFA, on 29 September at least 100 monks and nuns from the TAR were expelled, being driven away in buses. It has also been reported that of 2,000 nuns who have been ordered to leave so far, 400 come from Golog (Ch: Guoluo) prefecture and 300 from Yulshul (Ch: Yushu) prefecture, both in Qinghai province. In the past couple of weeks, videos have emerged on social media depicting emotional scenes of nuns boarding busses to leave Larung Gar. Nuns can be seen and heard crying, with many gathering to wave goodbye to their colleagues. The Chinese authorities continue to destroy dwellings at Larung Gar, though different media outlets report differing numbers. With the authorities restricting the flow of information from Larung Gar it is difficult to confirm exact numbers. Sources quoted by Radio Free Asia (RFA) say that 550 houses have been torn down between 20 July and 23 September, whereas earlier reports indicated 600 dwellings had been destroyed in the first week. Human Rights Watch have estimated that 2,000 dwellings have been removed since the demolitions began. RFA’s local sources say that 1,000 dwellings have been targeted for destruction by the end of the year. Evidence is also emerging of new construction work at Larung Gar aimed at increasing tourism. According to International Campaign for Tibet, major construction is taking place just outside the main entrance to Larung Gar, which is consistent with plans to build tourist accommodation such as guest houses. Chinese state media has refuted claims of destruction at Larung Gar being part of a policy of religious control. On 27 July, the Global Times quoted the Kardze government as saying Larung Gar was undergoing “renovations” aimed at “preventing fires and easing crowd levels”. Videos of the demolition work at Larung Gar have emerged on social media recently. In tandem with the demolition and expulsion programme at Larung Gar there has also been a tightening of security measures in the region. According to Human Rights Watch, an estimated 1,500 Chinese police and paramilitary troops were moved into nearby villages and towns prior to 20 July. Tourists have been prohibited from visiting Larung Gar and residents have been banned from sharing information and images of the demolitions. Those caught sending photos or reports could face serious punishment, including beatings and imprisonment. In the past week, RFA has reported that over 300 government officials have arrived at Larung Gar and are now going door-to-door to collect information on residents. According to a local source, the officials are asking for the residents’ hometowns and monasteries to enable selection for eviction. The same source says a report based on the gathered information and listing recommended evictees is to be produced by 30 October. Mass expulsions of monks and nuns are also taking place at Yachen Gar, another major Buddhist Institute in Sichuan. Both International Campaign for Tibet and Human Rights Watch have reported that approximately 1,000 students have recently been forced to leave Yachen Gar, located about 300km southwest of Larung Gar in Pelyul (Ch: Beiyu) county, Kardze prefecture. 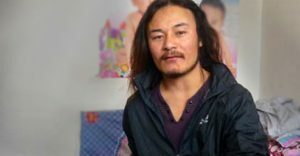 All those evicted are understood to be from the Tibet Autonomous Region (TAR) and the expulsions were carried out by TAR officials rather than local government officials. It is understood the evicted have been told they are not allowed to join any monastic institutions when they return home, nor are they allowed to carry out any public religious practices. Take action calling on the Chinese government to immediately halt the demolition and expulsions at the Larung Gar Buddhist Institute. Join in the Global Day of Action on 19 October: attend the peaceful demonstration in London; write to the Chinese authorities; and, write to your MP. Click here for more details.